Has certificate and both boxes. Has been displayed in a non-smoking household with pets. 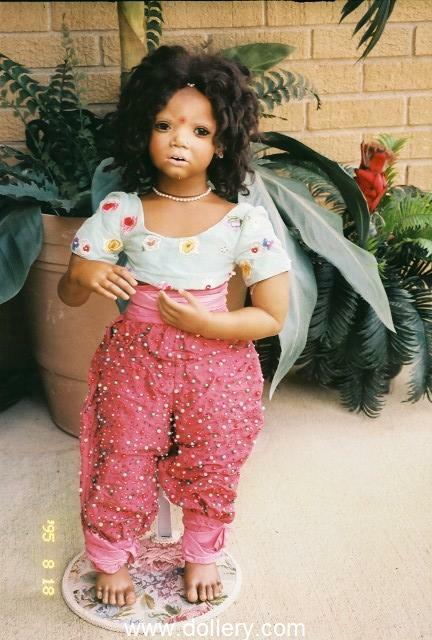 sorry - we cant find a professional image of this doll but click above to see the actual doll's images. Toni from the American Heartland Collection. 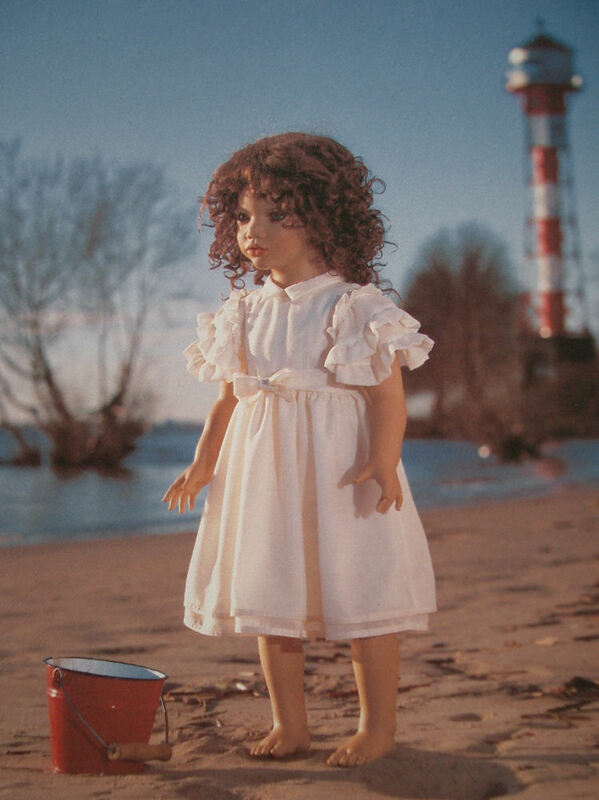 24"
but click above to see the actual doll's images. 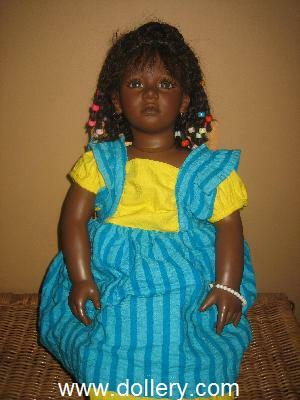 Ayoka, 28" We have 2 of these dolls available. 2. Still in original box, has certificate. Enzo, still in original box, has certificate. 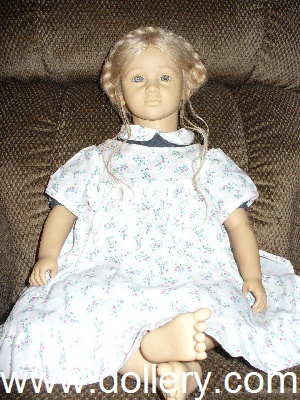 Vinyl, 23" 58cm sitting doll. Mint condition. Has never been displayed. Seller bought from a store that had bought it from a store that was going out of business. 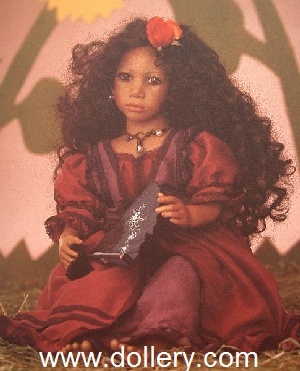 1993 Mohini, #5/80, Porcelain, black hair and brown eyes, 28". 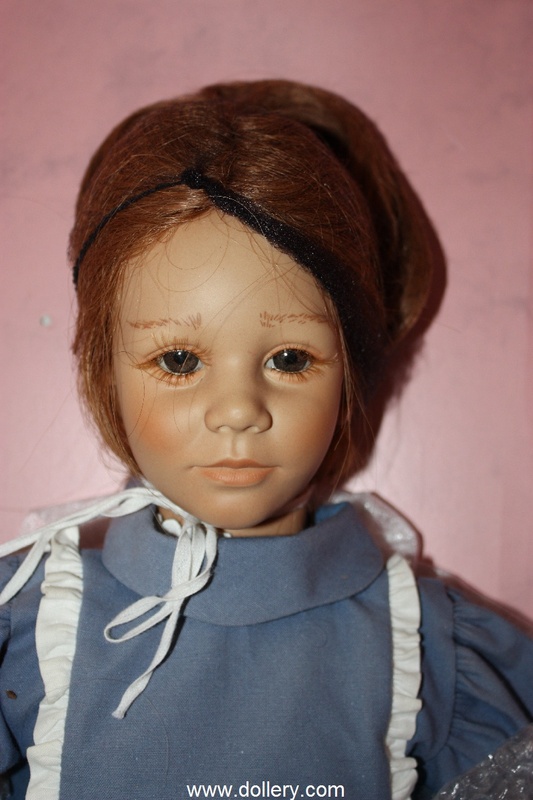 Doll is mint in box and was only taken out for this picture. 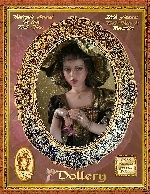 She also comes with a scarf, a pearl necklace and a bowl of white rocks which is in the box in a bag. Has certificate and inner and outer boxes. Customer ordered 2 and never put this one out. 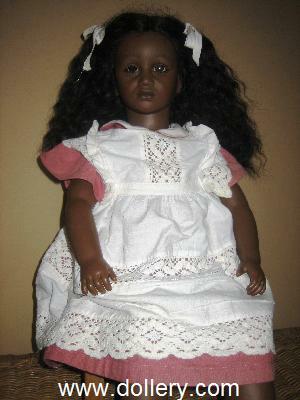 Email kmalone@dollery.com for pricing and information and more images. 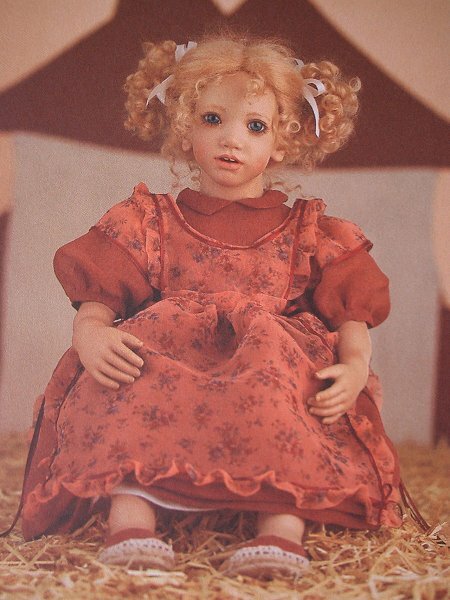 1994, Alke, LE/1 year blond hair and blue eyes, 29 1/2"
Doll is like new. We do have pictures available. 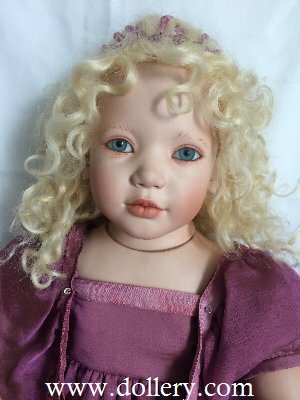 Tara from Hamburg, Germany, 20 1/2" 75cm, LE/1 year, honey blond human hair, blue plastic eyes. Currently stored in boxes in climate controlled facility. 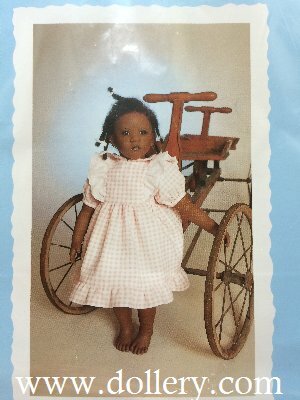 Awaiting images of the actual doll. We have a 2nd one available. Has certificate and both boxes. Has been displayed in a non-smoking household with pets. Panchita from Mexico, 27-1/2", LE/1 year. 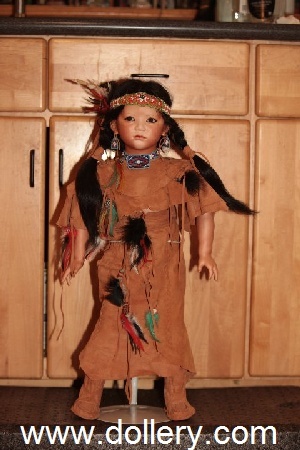 We actually have 2 of these dolls available. 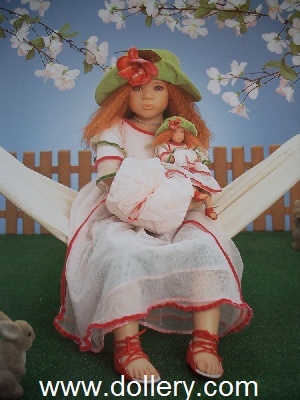 Aura, Gypsy from Spain, LE/1103, 23 1/2" sitting. Black human hair, brown plastic eyes. Stored in box at climate controlled facility. LE/1 year, 23 1/2" (60cm). Curly brown human hair, blue plastic eyes. Has inner box and certificate. Lina from Germany, LE/1 year, 23" sitting. 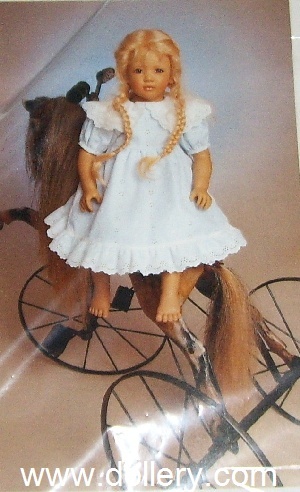 Blond hair, blue plastic eyes. Marlie from Germany, LE/1 year, 24". 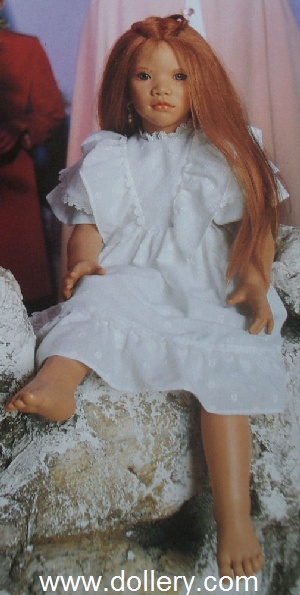 Red hair, blue plastic eyes. Merlin & Merle, LE/67 each. 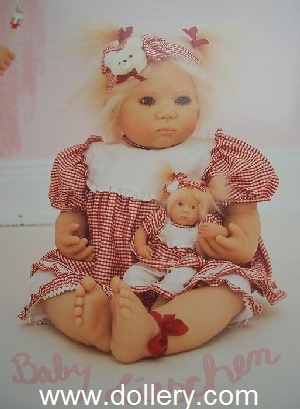 Club doll, from Netherlands, comes with her doll Bibi, LE/1 year production, 23 3/5", 64cm, blond hair, blue plastic eyes. #2. We have another one. .
#3. We have another one also. Awaiting images. Stored in box at climate controlled facility. Seller is checking to see if eyes have changed. #4. 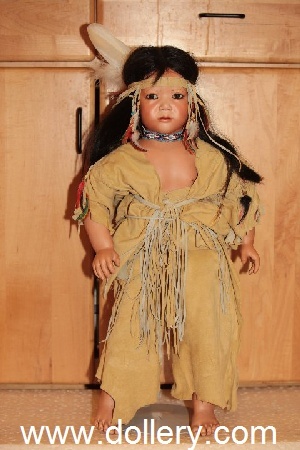 Another one has also been stored in a climate controlled facility but the eyes have changed to pink/yellow. 7 month old girl from Germany. 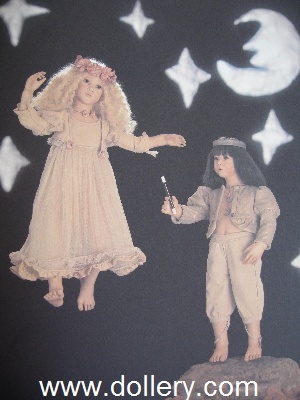 LE/1 year, white mohair, amber plastic eyes, 24" (61cm). #1. Currently stored in boxes in climate controlled facility. Has stains from red ribbon. #3. Has been displayed. 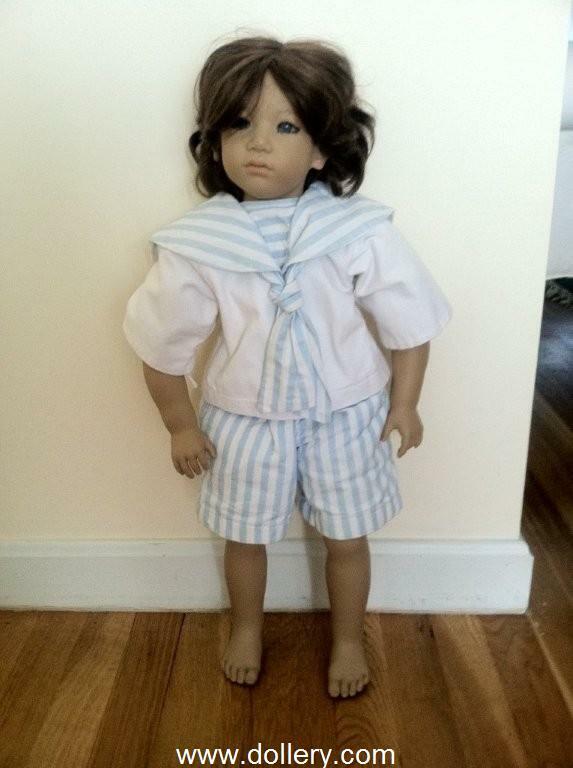 No original outer dress- DISCOUNTED - CONTACT KMALONE@DOLLERY.COM FOR ACTUAL CURRENT PHOTOS..
Oscar, 6 year old boy from Ireland. 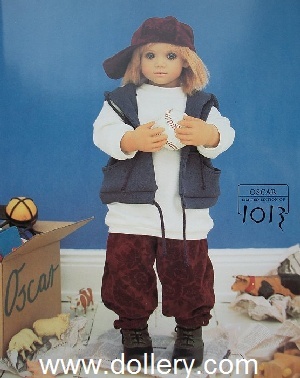 LE/1013, blond human hair, grey plastic eyes, 25" (64cm). Currently stored in boxes in climate controlled facility. 21" (53cm) vinyl. 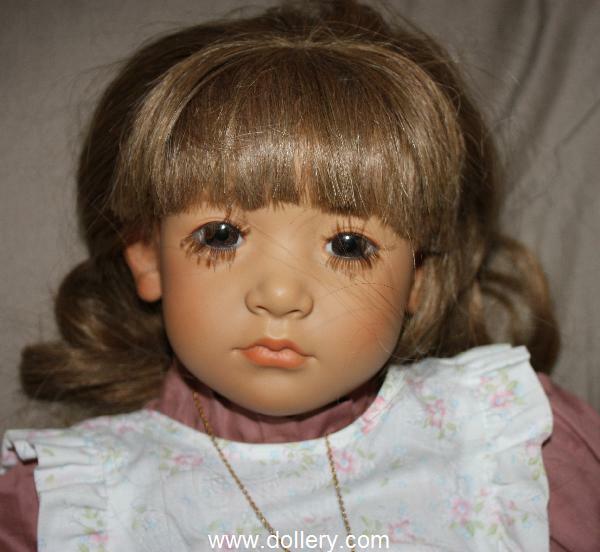 Has light amber colored plastic eyes. Has original box and paperwork. 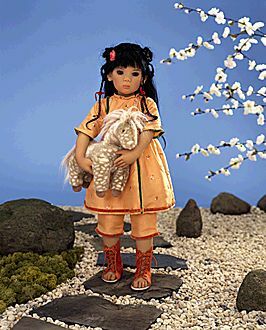 Mia Yin, 5 year old girl from China. 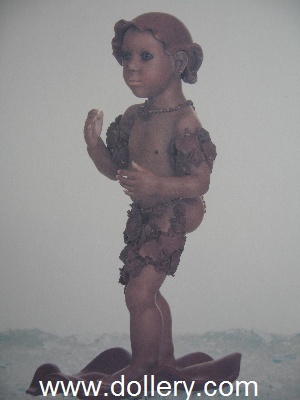 LE#172-1013, black human hair, dark brown plastic eyes, 26-3/4" (68cm). #1. Has inner box only, has certificate. Non-smoking household, no pets. #2. We do have another also. Currently stored in box at climate controlled facility. 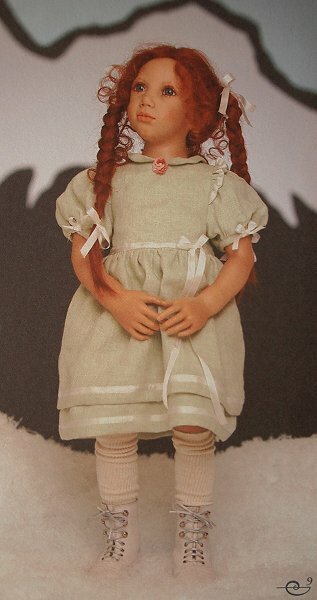 Mirte, 7 year old from USA, Limited to 1 year production, red human hair, grey plastic eyes, 35-1/2" (90cm). #1. 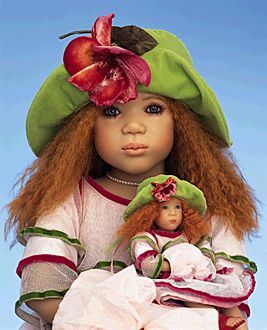 Has kleine with her. Currently stored in boxes in climate controlled facility. #2. 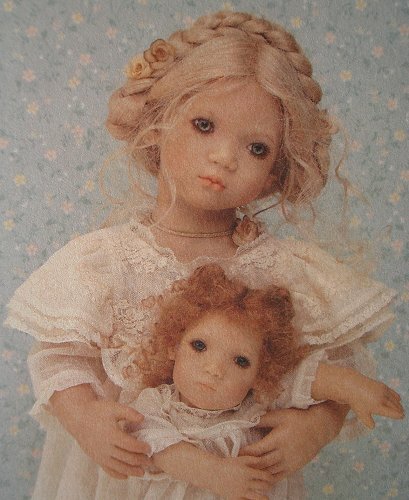 Has kleine with her. Was displayed for a few weeks and then stored away. Never undressed. Eyes have faded. 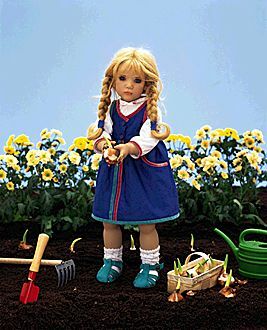 Ullwa from Norway, Limited to 1 year production, blond hair, blue eyes, 24-1/2".